The Scoop: Fran Greene, LCSW, the Flirting, Dating, and Relationship Coach, got her start by teaching singles how to flirt at the Learning Annex in New York City. She found she had a knack for putting some of dating’s most subtle signals into clear and obvious terms. Later, she literally wrote “The Flirting Bible” to give singles from all walks of life the tools they need to land a date wherever they go. These days, where they go is mostly online, so Fran has updated her repertoire of dating skills to include online flirting tactics. She has written a new book that recommends outside-the-box flirting strategies, including introducing yourself to someone on Twitter, to encourage singles to come out of their shells and start making real-life personal connections. Once upon a time, singles paid up to $150 to post a personal advertisement in a newspaper. It was a one-shot deal. You placed the ad and hoped your heartthrob read the personals section on the day it ran. Maybe the paper would have high circulation and yield great results. Maybe you’d come up dry and have to pay to try again another day. Placing personals wasn’t the most effective way to get a date, but singles in the 20th century relied on it to get themselves on the radar of society’s eligible bachelors and bachelorettes. Today, that system has become lightning-fast and much more affordable. Singles can post a personal ad (aka dating profile) instantaneously on a dating site and leave it up for free. A well-worded profile can receive hundreds or even thousands of views in a single day. Fran Greene’s book lays out a five-step plan to heal a broken heart. Online dating has offered singles plenty of date opportunities, but that can be overwhelming for people who aren’t tech-savvy and don’t know how to navigate this brave new world of online flirtation. Fortunately, Flirtation Expert Fran Greene has studied the nuances of offline and online dating and come up with flirtation guidelines for singles. Fran has spent decades teaching singles how to use body language and social cues to indicate romantic interest, and now she has begun shifting her focus to online flirtation techniques. Her newest book, “The Secret Rules of Flirting,” includes chapters abut online dating, texting, and social media. Over the last decade, Fran has seen technology influence the flirting game in various ways and now seeks to push modern daters to transition from online flirtation to offline romance ASAP. Fran Greene has spent the last year interviewing couples who met via social media websites. She talked to people who found dates and love online, but not on dating sites, to gain insight into how different platforms can play a role in modern romance. “The Secret Rules of Flirting” offers valuable advice to boost your self-confidence. Her book, “The Secret Rules of Flirting,” which will be released on Sept. 4, explores online flirting techniques used by singles of all ages. She advises modern daters to take advantage of popular platforms, including Twitter and Facebook, in their search for compatible dates. Fran’s simple yet winning flirting formula can help anyone increase their chances of getting a date as they browse the web in their free time. Her action-oriented approach to dating is inspirational for singles who are tired of sitting on the sidelines and want to get into the game and get results. 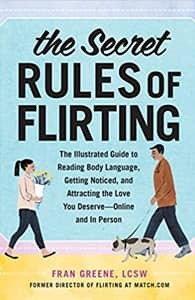 Anyone feeling unsure of how to express interest offline or online can use “The Secret Rules of Flirting” as a straightforward guide to romance. Fran’s new book is currently available for pre-order, and she will offer a 45-minute complimentary consultation for anyone who orders the book prior to Sept. 4th. In addition, Fran will offer another complimentary 45-minute flirting and dating consultation for anyone who posts a review on Amazon.com. Fran has years of experience as a dating coach, and her specific feedback can be a great help to singles. In addition to her books and workshops, Fran has also made a name for herself as a reliable wingwoman in the dating scene. She conducts in-real-life coaching with clients who would like some hands-on assistance as they flirt with people. Sometimes these clients are recently divorced, and sometimes they have no experience in the dating scene at all. Fran is adept at working with singles of all backgrounds. They go out to social areas, including bookstores, shopping malls, and bars, and start approaching date prospects together. Fran observes the client’s flirting skills and provides guidance when necessary to ensure every approach leads to a good experience. It’s great practice for the client. Fran creates a safe learning environment where singles of all ages hone their social skills and become adept at starting conversations with people in everyday situations. This confidence-building program has been greatly successful so far. Fran said she has seen shy singles come out of their shells and collect multiple phone numbers in one outing. Through diligent research and observation, Fran has kept up with the dating scene and pinpointed trends among singles. She told us something she’s noticed is that singles have begun spending more time looking for dates than actually going on dates. She referenced the 80/20 rule in the business world, which states that 80% of business comes from 20% of clients, and challenged daters to stop spending 80% of their time surfing on dating sites and apps and actually meet people in person. In 2019, Fran plans to offer a coaching program that will encourage participants to only spend 20% of their time surfing dating sites and 80% of time on actual dates. Her mindset is that it’s just a date, and, if you really want to meet the love of your life, it doesn’t cost much (an hour or two of your time) to explore romantic opportunities by going out with someone new. You never know what can happen. Another coaching product Fran is developing and plans to release in 2019 is her 60-Day Action Plan that motivates singles to do something every day to make a connection and increase the odds of finding someone special. Fran’s detailed 60-Day Dating Action Plan will help singles dive into the dating pool. It will focus on individual goals — whether it’s casual dating, a committed relationship, or marriage. The best part of the plan is that it motivates singles to accomplish a dating objective every day. Fran understands that dating can be overwhelming, and so she keeps people focused and accountable so they don’t give up. From what to say in a first message to when you should exchange contact information, Fran teaches singles what to do to make an excellent first impression on the web. Despite all the technology and tools at our disposal, dating still boils down to making a personal connection using solid flirtation and social skills. Fran Greene has spent years teaching people how to flirt and build connections through a variety of time-tested techniques. Whether you’re meeting someone online or offline, Fran can tell you how to put your best foot forward and create chemistry by being authentic, confident, and upbeat. In recent years, Fran has written extensively about flirting on social media platforms and dating sites and updated her comprehensive “Flirting Bible” to include the latest trends in dating. Her new book explores ways to get singles off their laptops and phones and into first dates. 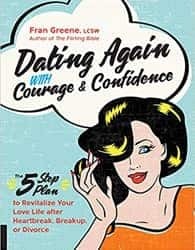 Fran has graciously agreed to offer our readers a complimentary personalized dating consultation if they post a review of “Dating Again With Courage and Confidence” on Amazon.com. Amber is a Contributing Editor for DatingNews. She is a prominent figure in the dating industry and has penned well over 1,000 articles on every dating topic under the sun. She has written in-depth profiles on dating professionals, reviewed dating sites, given dating advice, and covered the latest trends in the dating scene. She understands all the ins and outs in the industry and is excited to bring that wealth of knowledge to DatingNews.